Nyango Star drumming to a song by popular Japanese “idol”/metal fusion band BABYMETAL. Screencap from official Nyango Star YouTube channel. A tweet featuring a Japanese apple-shaped plush mascot banging on the drums has gone viral at the start of March. So far, the video of cult superstar Nyango Star playing the drums to the “Anpan March,” the theme from a popular children's television show, has been retweeted 91,000 times and has received 113,000 likes. He doesn't just rock out to tunes like ‘Crimson’ (Kurenai, 紅) by X Japan, here's Nyango Star playing for the Anpan March for kids! Here's the second song he did. Take a look. The drumming just gets more and more intense. Nyango Star is a ‘yuru-chara’ mascot from Kuroishi, in the middle of Aomori Prefecture, in northeastern Japan. The term ‘yura-chara’ is a combination and abbreviation of the Japanese words for “light-hearted and gentle” and “character”, or mascot. All regions of Japan boast one or more such mascots. Nyango Star gets its shape from the apples that have made Aomori famous in Japan. Apparently, the mascot is also part cat. Combine the sound a cat makes in Japanese (nyan) with the Japanese world for ‘apple’ (ringo), and you get the name Nyango. The Aomori mascot gets the rest of its name from famed Beatles drummer Ringo Starr. 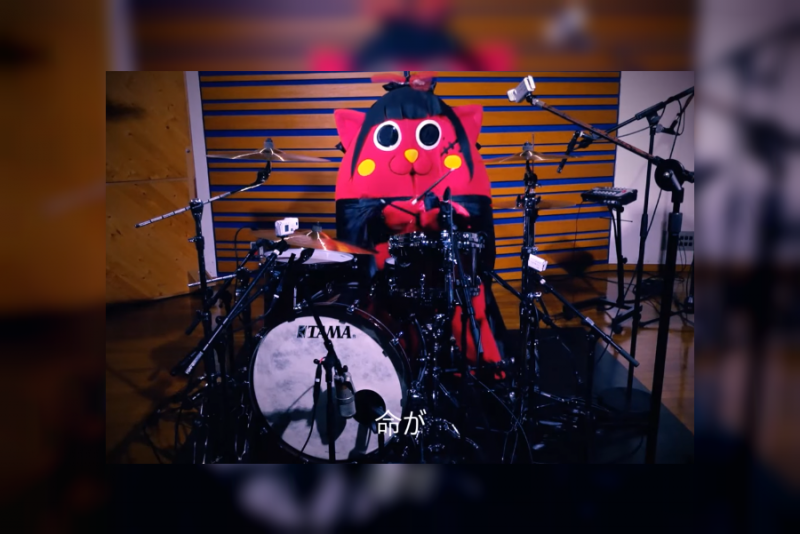 In this video, Nyango Star plays the drums in time with the “insanely difficult” song “Crimson” (Kurenai, 紅) by popular rock band X Japan at a university student culture in Aomori Prefecture. More of Nyango Star's drumming videos can be found on the official Nyango Star site, and on his Twitter, Instagram and YouTube pages. More explanation in English about Nyango Star can be found on Japanese pop culture blog Grapee.